Regardless of how old you are, it’s important to plan for your retirement, and the sooner you get started the less of a chance you will have of outliving your income. But in this day and age, it can seem like a challenge. I’m reminded of a short article I read a couple of years ago. It said that most baby boomers are worried that the money they have saved for retirement will not be enough to get them through their remaining years, and most of them will be forced to work past the age of 65. This is a startling statistic, as it reflects the impact that inflation has had on our economy. But there are still some things you can do to keep from getting behind the proverbial eight-ball, and the first step is to find a retirement account. It will allow you to set money aside for when you reach a certain age, and it will incur interest for the life of the account. Even if you have a current 401(k), you should still consider getting an Individual Retirement Account (IRA) to supplement it. And Betterment has a list of providers that you can access through an easy-to-use interface. Both accounts are similar in many respects, but there is a difference in how they’re taxed. Any contributions made to a traditional IRA are done on a “tax-deferred” basis. This means that no taxes are paid on that money until it withdrawn. The same is true with any interest that is made on the account. You will not, however, be able to deduct any of your contributions on your tax return. A Roth IRA, on the other hand, does not have that same privilege. Even though you have contributed money to the account, you will still have to pay tax on it at the end of the year. But you will not have to pay it again once the money is withdrawn. Any interest you earn will also grow tax-free. The beauty of a Roth IRA is that you will have a bundle of tax-free cash when you retire. This can give you a significant advantage, as you will have more money to use when you get older. A Roth IRA is better for younger people who expect their income to grow in the future. A traditional IRA is preferable for people over the age of 50 who expect their income to shrink. 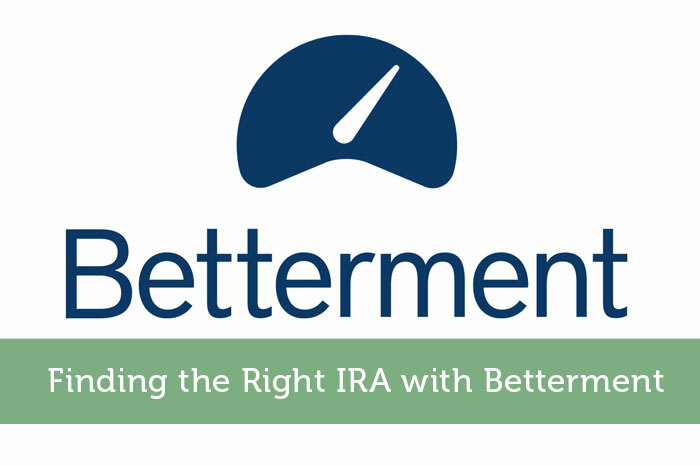 As I said before, Betterment has a list of IRA providers that you can easily access on their website, and it gives you the ability to transfer money directly from your bank account. You even have the option to rollover money from an existing IRA, which can be an advantage if you prefer not to use what you have in the bank. There are, however, limits on how much you can contribute to an IRA. You can only contribute $5500 a year to an IRA if you’re under 50, and there is a 10% penalty if you withdraw it before you’re 59 ½. Also, you will not be able to open an IRA if you’re over 70 ½. And they are offered at a lower cost than if you were to go through another source. But the real beauty of getting an IRA through an online broker is that there are no minimum account balances, which can be a huge advantage if you don’t have a lot to put in. With that, you have no reason to put off saving for retirement.